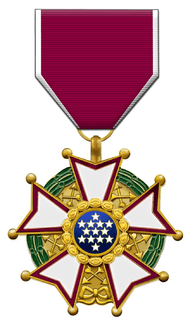 The Legion of Merit (Commander degree) is one of only two United States military decorations to be issued as a neck order (the other being the Medal of Honor) and the only United States military decoration which may be issued in award degrees (much like an order of chivalry or certain Orders of Merit). The Legion of Merit is sixth in the order of precedence of U.S. military awards and is worn after the Defense Superior Service Medal and before the Distinguished Flying Cross. In contemporary use in the U.S. Armed Forces, the Legion of Merit is typically awarded to Army, Marine Corps, and Air Force general officers and colonels, and Navy and Coast Guard flag officers and captains occupying senior command or very senior staff positions in their respective services. Authority to award the Legion of Merit is reserved for general officers and flag officers in pay grade O-9 (e.g., Lieutenant General and Vice Admiral) and above, civilian Department of Defense personnel at assistant service secretary or Assistant Secretary of Defense level and above, or equivalent civilian personnel with the Department of Homeland Security with direct oversight of the U.S. Coast Guard. In a letter to the Quartermaster General (QMG) dated December 24, 1941, the Adjutant General formally requested action be initiated to create a Meritorious Service Medal and provide designs in the event the decoration was established. Proposed designs prepared by Bailey, Banks and Biddle and the Office of the Quartermaster General were provided to Assistant Chief of Staff for Personnel Colonel Heard) by the QMG on January 5, 1942. The medal was announced in War Department Bulletin No. 40, dated August 5, 1942. Executive Order 9260, dated October 29, 1942, by President Franklin D. Roosevelt, established the rules for the Legion of Merit and required the President's approval for the award. The Legion of Merit is similar to the French Legion of Honor in both its design, a five armed cross, and in that it is awarded in multiple degrees. Unlike the Legion of Honor, however, the Legion of Merit is only awarded to military personnel. Additionally, it is the only award in the world with multiple degrees of which the higher degrees cannot be awarded to citizens of the country of the award's origin. In October 1942, Brazilian Army Brigadier General Amaro Soares Bittencourt became the first person awarded the Legion of Merit (Commander) and a week later, Lieutenant Junior Grade Ann A. Bernatitus, a Navy Nurse, became the first member of the United States Armed Forces and the first woman to receive the Legion of Merit. She received the award for her service during the defense of the Philippines. LTJG Bernatitus was also the first recipient of the Legion of Merit authorized to wear a Combat "V" with the medal. In 1943, at the request of Army Chief of Staff General George C. Marshall, approval authority for U.S. personnel was delegated to the War Department. Executive Order 10600, dated March 15, 1955, by President Dwight D. Eisenhower, again revised approval authority. Current provisions are contained in Title 10, United States Code 1121. As a result, awarding authority for the Legion of Merit resides with general officers/flag officers at the Lieutenant General / Vice Admiral level or higher. The Navy, Marine Corps and Coast Guard, unlike the Army and, later, the Air Force, provided for the Legion of Merit to be awarded with a "V" device indicating awards for participation in combat operations. From 1942 to 1944, the Legion of Merit was awarded for a fairly wide range of achievements. This was because it was, until the establishment of the Bronze Star Medal in 1944, the only decoration below the Silver Star which could be awarded for combat valor as well as being the only decoration lower than the Distinguished Service Medal which could be awarded for meritorious non-combat service. After World War II, the Legion of Merit was awarded almost exclusively to senior officers in the rank Lieutenant Colonel (Army, Marine Corps and Air Force) or Commander (Navy and Coast Guard) (O-5) and above. Around the 1980s the Legion of Merit began to be awarded more frequently to senior ranking warrant officers (W-4 and W-5) as well as senior enlisted service members (E-8 and E-9), usually as a retirement award. The ribbon for all of the decorations is 1 3⁄8 inches (35 mm) wide and consists of the following stripes: 1⁄16 inch (1.6 mm) white; center 1 1⁄4 inches (32 mm) crimson; and 1⁄16 inch (1.6 mm) white. The reverse of all of the medals has the motto taken from the Great Seal of the United States, "ANNUIT COEPTIS" ("He [God] has favored our undertakings") and the date "MDCCLXXXII" (1782) which is the date of America's first decoration, the Badge of Military Merit, now known as the Purple Heart. The ribbon design also follows the pattern of the Purple Heart ribbon. Additional awards of the Legion of Merit are denoted by oak leaf clusters (in the Army and Air Force), and by 5⁄16 inch (7.9 mm) stars (in the Navy, Marine Corps, and Coast Guard). The sea services (i.e., the Navy, Marine Corps, and Coast Guard) may also authorize the Combat "V" for wear on the Legion of Merit, while the Army and Air Force do not authorize the "V" device. ↑ Note: National Oceanic and Atmospheric Administration Commissioned Officer Corps Amendments Act of 2012 amended the Legion of Merit to be awarded to any uniformed service. ↑ "Legion of Merit". Awards. Institute of Heraldry. Retrieved April 26, 2010. ↑ "Types of the Medal of Honor: 1862 To Present." Congressional Medal of Honor Society. Retrieved: July 23, 2006. ↑ Department of Defense Manual 1348.33-V3. http://www.dtic.mil/whs/directives/corres/pdf/134833vol3.pdf. Retrieved Assistant 20 August 2014. ↑ Borch III, Fred L. (2013). Medals for Soldiers and Airmen: Awards and Decorations of the United States Army and Air Force. Jefferson: McFarland & Company Inc. p. 124. ISBN 9780786474127. Retrieved 29 August 2015. ↑ "Ann Bernatitus - Angel of Bataan, First Legion of Merit recipient". Home of Heroes. This is a detailed Home of Heroes combat biography of Lt. (j.g. ), later, Capt. Ann Bernatitus (USN) with sources and also containing a discussion of Legion of Merit itself with sources. ↑ New York Times. December 7, 1945. ↑ "November 26th, 1943 - FDR: Day by Day".